PrepLadder congratulates Dr. Dilip on clearing FMGE June 2018 exam. We wish him all the very best for his career and future ahead. Hi. 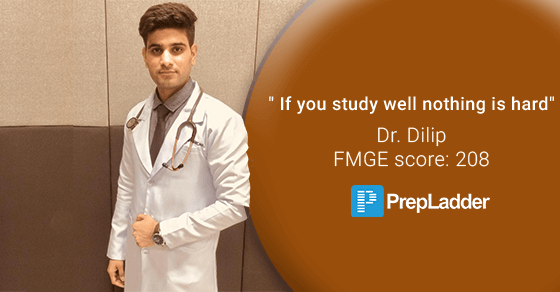 I am Dr. Dilip, a student of Davao Medical School Foundation (Philippines), I scored 208 marks in FMGE exam 2018. According to you what is the correct approach to study for FMGE? Only MCQ's or Theory + MCQs? Studying both theory and MCQ's will help you a lot. For preparation, you should start as soon as possible because you can get enough time at the last for revising subjects. I and my colleague studied notes which were provided by our institute and the BIBLE FOR FMGE BY DR. DEEPAK MARWAH, best book ever. Yes, I cleared the exam in the first attempt. For half of the day you should read new topics and for the rest half of the day, you should revise the old ones. Yes, Prepladder helped me a lot, we used to give all the mock test and also use to practice MCQ's from the app. Also, I would like to thank PrepLadder for conducting Pre-FMGE Mocks by Dr. Deepak Marwah. The mocks were very beneficial. I scored 154 and 164 marks in the mocks which boosted my confidence and finally, I cleared FMGE by scoring 208 marks. In the starting, we just used to read and revise but in the last month, we made a timetable like 3-4 subjects revising a day. Frankly speaking, I was an average student in school days and in graduation. If you study well nothing is hard and if you don't study even the easiest subject will be hard, but focus mostly on minors. It's just a screening exam, don't worry everyone can do it, just be dedicated and be focused, don't leave any subjects but focus more on minors and believe it or not ‘REVISION IS KEY TO SUCCESS’. THIS IS NOT THE END, THIS IS THE BEGINNING. ALL THE BEST. We thank Dr. Dilip for sharing his success story.